THE NEW ATHENIAN: How credible is Erdogan on refugees? How credible is Erdogan on refugees? On May 25, just a day after the World Humanitarian Summit had concluded in Istanbul, Turkish President Recep Tayyip Erdogan warned the EU that unless it implemented a visa waiver for Turkish nationals without imposing conditions, his country would not enforce a readmission agreement for refugees. "If you're still imposing criteria on Turkey which provides important support to the European Union by preventing those living in camps and pre-fabricated homes who are waiting to go to Europe (from getting there), then I'm sorry," the Associated Press quoted him as saying. The implied threat is broader than readmission. 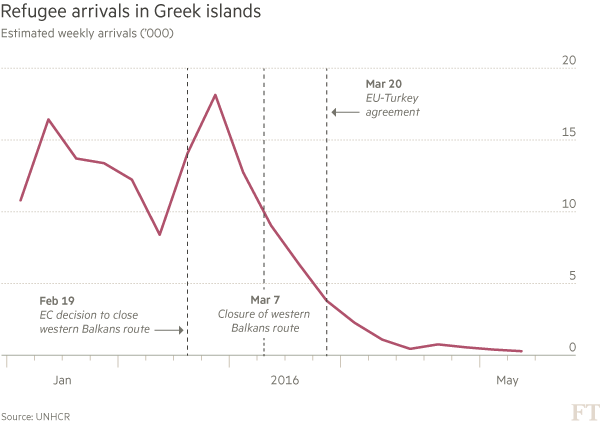 If Turkey should abandon a “statement” made on March 20 with the European Union, it is presumed that refugee and migrant flows from Turkey to the Greek islands might shoot up to thousands a day, as they had done at the end of last year. For the past few weeks those flows are down to dozens a day. The Hellenic Coast Guard rescued 126 between Friday morning and Monday morning. That reduction is attributed to the Turkish enforcement of the March 20 deal, which stipulates that it will prevent refugees from crossing in the first place, as well as readmit them. Does that mean that Turkey can credibly imply a threat to inundate Europe with refugees again, should the March 20 statement fall apart? European Migration Commissioner Dimitris Avramopoulos certainly seems to think so. There are data to counter this view, however. 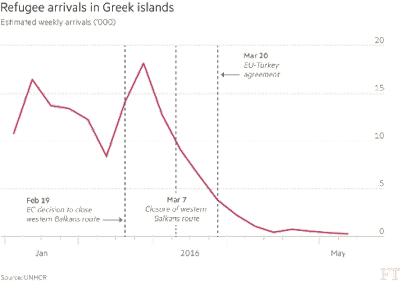 A graph of refugee flows across the Aegean compiled by the Financial Times Brussels Blog (below) based on UNHCR tallies, casts doubt on whether Turkey’s goodwill is the exact cause of that reduction in flows. It shows that flows peaked in November 2015, and were already sharply reduced when the March 20 statement was made. It also shows that none of the milestone events since last autumn – including the closure of the Western Balkans route – had a definitive impact on flows on its own. The reduction seems to be sustained and organic. What, then, is its cause? Undoubtedly Turkey’s stricter patrolling of its borders with the help of a NATO task force is a factor in the reduction of flows, but there are others. Europe’s unwillingness to take in more refugees, the closure of the Western Balkans route, the fact that refugees had to wait for weeks and months to be processed and the deportations of many back to where they had started their journeys are almost certainly all factors. The graph suggests that Turkey’s role as guardian has been only a partial explanation at best. What of the standing population of three million-odd refugees and migrants in Turkey, many of whom have been there for years? Could they not be unleashed upon Europe? Past evidence suggests that they form a minority of migrant flows. Between April and September last year, the UNHCR polled 1,245 Syrians arriving in Greece. It found that nearly two thirds - 63 percent – had left Syria in 2015. While the UNHCR stresses that this sampling is not necessarily representative of all Syrian refugees crossing into Greece, it chimes with anecdotal evidence that last year’s surge of migrants from Syria was largely made up of newly departed refugees. The fact that the number of refugees staying in Turkey has remained constant and even grown suggests that most of the three million lack the funds to pay smugglers, or have found some form of gainful employment in Turkey’s black labour market, and will stay as close to Syria as possible awaiting the war’s end. A final factor to consider is Erdogan’s political self-interest. The European Commission has offered Turks visa-free travel on condition that Turkey revise its anti-terrorism laws to exclude journalists and political enemies. Erdogan’s refusal to accept these terms may be in earnest, but it still carries political cost. The real reason to heed Erdogan is that regional instability for political and environmental reasons is likely to continue in North Africa and the Middle East, and migratory pressure on Europe is likely to be long-term. The EU needs to establish an immigration policy to counter this, which is enforced in its consulates across the region. Paying Erdogan to be Europe’s bouncer will not be a substitute to that.